New Age Of Activisim.com FOREVER: We continue to recognize Excellence Honorees 2019 - I AM! 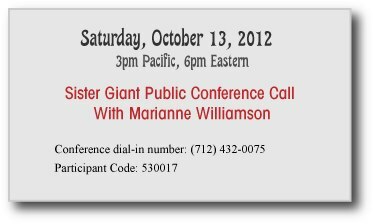 : Marienne Williamson says:Still deciding whether or not to attend or live stream SISTER GIANT? Listen in on the Conference call today to find out more. Have your computer in front of you, please. Write in questions to marianne@sistergiant.com, and I'll answer them as they come in. Marienne Williamson says:Still deciding whether or not to attend or live stream SISTER GIANT? Listen in on the Conference call today to find out more. Have your computer in front of you, please. Write in questions to marianne@sistergiant.com, and I'll answer them as they come in.